There’s something special about an August Summer Day. The leaves are lush and green. The garden is overflowing with deliciousness. The sun warms the air and I feel just like a contented cat, stretching in the sunshine, soaking up all the last bit of summer goodness. 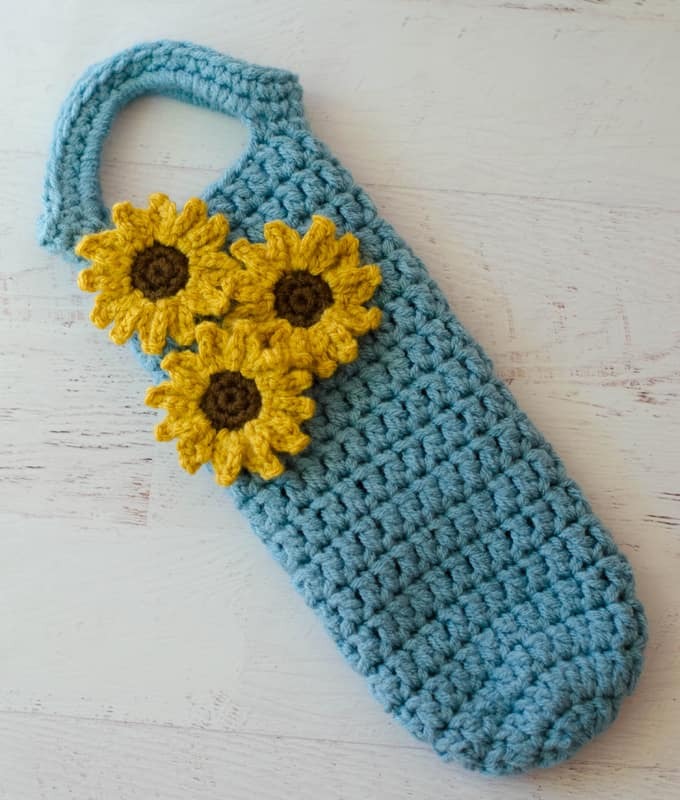 And that’s kind of how I feel about this beautiful, yet simple sunflower wine cozy. My mom is a summer baby and her birthday has always been a special time full of summer memories with family. This year seemed even more precious for some reason. Probably because we lost the last of John’s parents this past year. And I realize how life is just so fleeting. An ebb and flow of beginnings and endings. You really have to savor the moments you have with the ones you hold dear. And so I ended up with a hodge podge of unrelated birthday gifts for my mother this year. 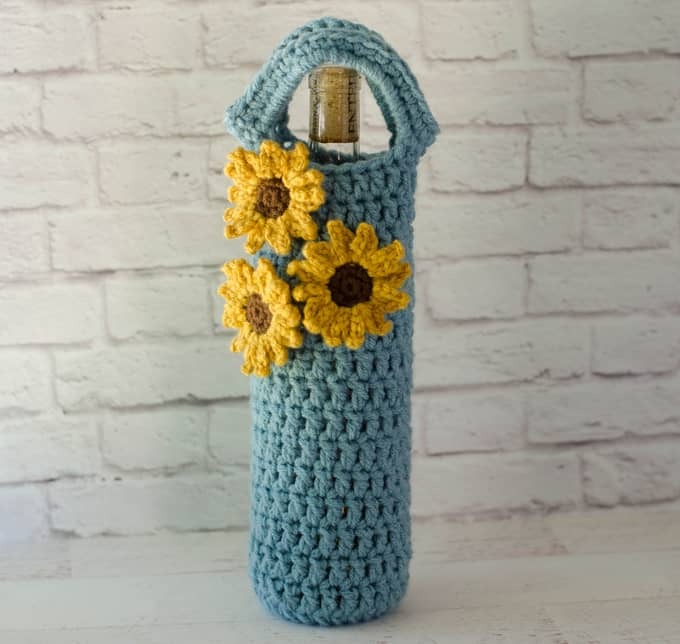 This lovely sunflower wine cozy and a bottle of wine. The Seed Stitch Dishcloth. A big fat jar of unfiltered honey from the Farmer’s Market. And a few other odds and ends. We couldn’t quite coordinate all the family at once for our usual out-to-dinner celebration. So mom was perfectly happy being celebrated twice! So I took my bag of gifts and she was just delighted with everything. My mom is very gracious and can make you feel like you’ve given her the world when you’ve made something special just for her. 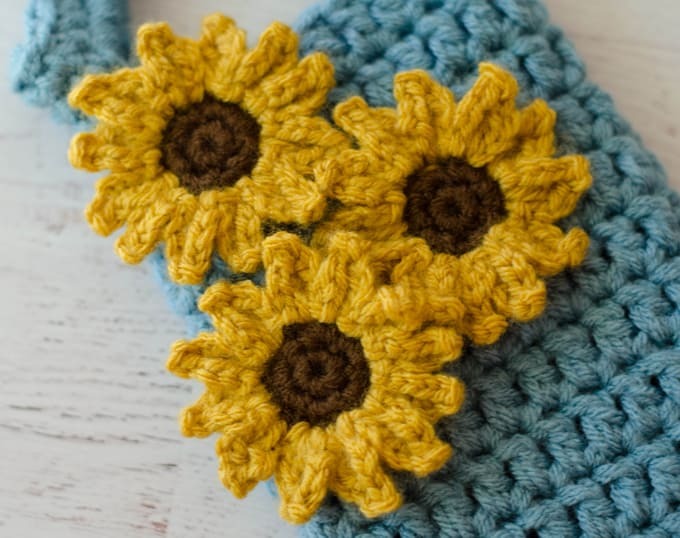 Maybe you’d like to make this sunflower wine cozy for someone you love. As you can probably tell, the wine cozies are some of my favorite things to make. It all started with the Fall Wine Cozy, then came the Snowman wine cozy and two more Christmas cozies here and here. And I almost forgot the Football wine cozy and Flag wine cozy! They are just too much fun to make. They look good when they are done and they make for a nice gift! If you haven’t made a wine cozy yet, you should give it a try; you just might get hooked! Wine cozy is worked using 2 strands of yarn. So either pull a strand from the outside and inside of the yarn skein or wind a small ball to use as your 2nd strand. R1: Using 2 strands of yarn, make a magic ring, chain 3 (counts as 1st dc) 11 dc in ring (12 dc total). Sl St to 1st st.
R3-17: Ch 3 for 1st stitch, dc in remaining stitches (24 st) Sl st to 1st st. The flowers are worked using just one strand of yarn and a G size hook. When finished, sew on to wine cozy, referring to photo. R1: ch 1 and work 6 sc in ring, sl st to 1stsc. R3: Attach yellow with a slip stitch to any stitch. *In the same stitch, work (ch 2, dc, ch 3, sl st in 1stch, dc, ch 2, sl st), sl st to next stitch. Repeat from * around to form 12 petals. Fasten off. Sew on to wine cozy. I love seeing your finished projects! 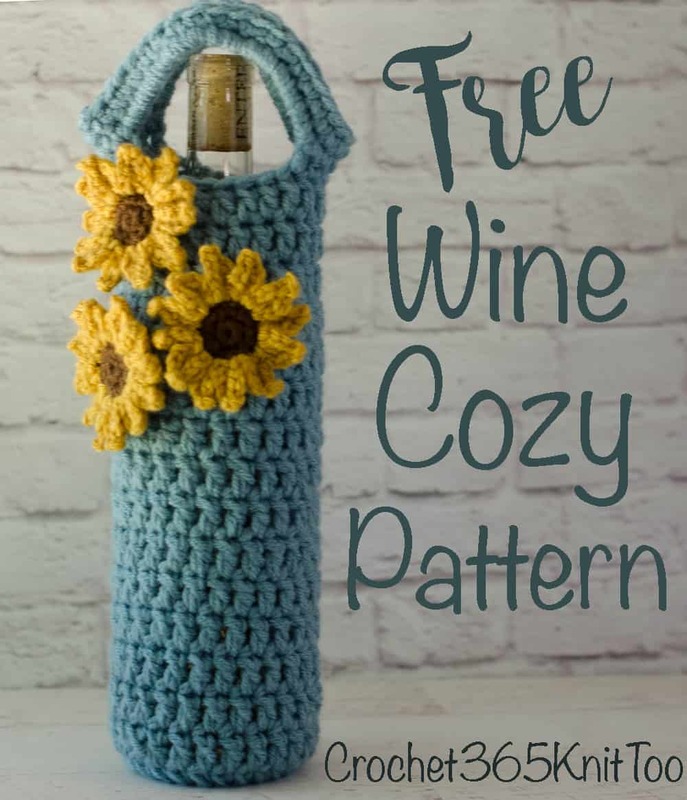 If you enjoyed making the Sunflower Wine Cozy, I’d love to see yours on Instagram, be sure to tag me @crochet365knittoo. If you are on Facebook, stop over to the Crochet 365 Knit Too Facebook page and share a photo! I’d love to see your work! Written pattern copyright Cheryl Bennett 2018, all rights reserved. Please do not reprint or repost this pattern. 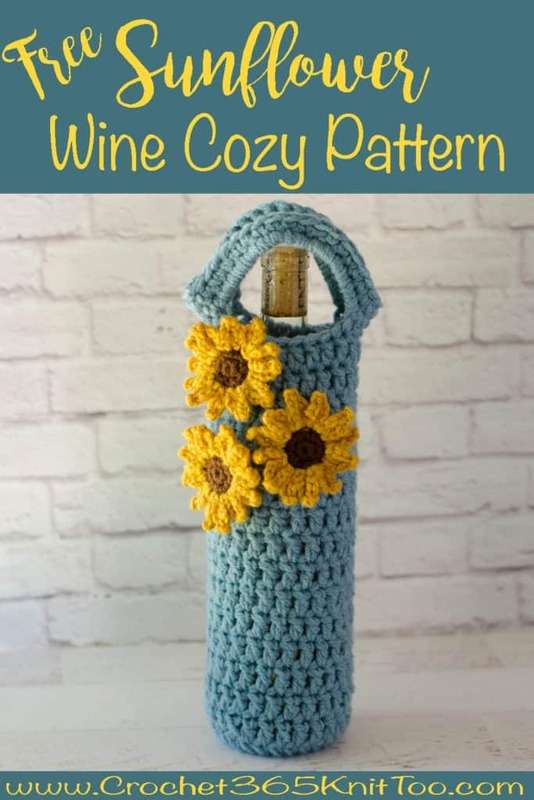 If you would like to share this Sunflower Wine Cozy pattern with others, just link to this page. If you’d like to make items for sale from this pattern, please visit my About page for more information.